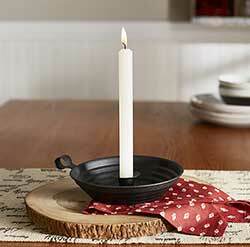 Accent your favorite candle by pairing with one of our candle pans, to make an instant centerpiece or shelf accent! 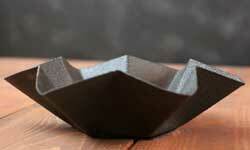 Black Star Candle Pan, by Park Designs. Use this primitive black metal star-shaped pan to hold a pillar candle, fill with potpourri...or both! This is for the medium sized pan, which is 8 inches in diameter at the top. Use to display decorative rocks, candles, or potpourri. Also looks really pretty hanging on the wall! Crimped Candle Pan, by Park Designs. Sold individually from the three in photo - Choose the Small (5.5 inches), Medium (7.25 inches), or Large (9.25 inches) pan. Use to display decorative rocks, hold pillar candles, or pair with a glass cloche! Made of metal. (This is just for the pan, decorative items are just for display ideas). Pudding Mold Candle Pan, by Park Designs. Use to display decorative rocks, candles, or potpourri. Also looks really pretty hanging on the wall! Measures 2.25 x 5.25 inches. Made of metal. (This is just for the pan, decorative items are just for display ideas). 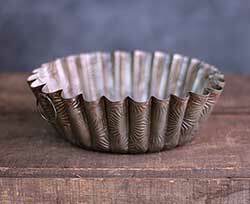 Ruffled Tin Candle Pan, by Colonial Tin. 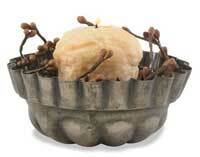 Classic primitive fluted metal candle pan with a siny galvanized tin finish. The perfect size for fat pillar candles - add a candle ring or pour in some dried rosehips to complete the look! Measures 9.25 inches in diameter at the top, 6.5 inches in diameter at the bottom, and stands 2.25 inches high. 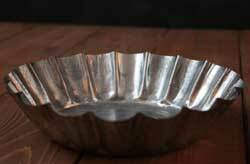 Ruffled Tin Candle Pan, by Colonial Tin. 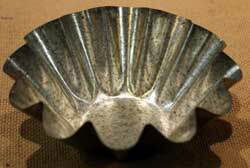 Classic primitive fluted metal candle pan with a antiqued and galvanized tin finish. The perfect size for slim to medium sized pillar candles - add a candle ring or pour in some dried rosehips to complete the look! 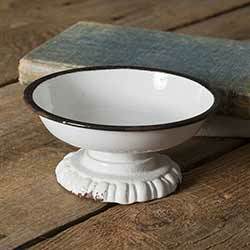 Measures 7 inches in diameter at the top, 2.75 inches in diameter at the bottom, and stands 2 7/8 inches high. Perfect for supporting your grubby taper candles, this candle holder is rustic iron with a black finish.